Saturday was the Annual Two Phase Event where three encouraging tracks, designed and built by Adam Stevenson provided plenty of challenges for all competitors. Sharon and Raymond Cullen had put significant effort into the fence decorations which were much admired by all. 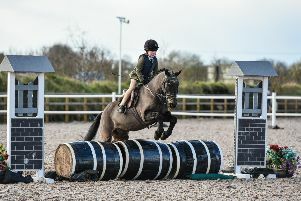 The1m class was divided according to speed with the first section confined to competitors who wished to pitch themselves at Eventing Ireland’s Novice speed while the second class was run at Pre Novice speed. Event 1 saw the top five competitors finishing on a zero score and inside the time. Finishing spot on the optimum time and taking first place was Toni Quail and the fabulous Ringfort Rua. Holly Boal and the equally fabulous Bonmahon Flash were in the runner up spot with Denis Currie and Arodstown Aramis coming a very close third. Meantime, sixteen of over fifty competitors finished on a clean slate and inside the time in the second 1m class where Alex Cleland and Rafa Smash shared the spoils for first place with Emily Corbett and Layla. Laoise O’Farrell who had been doing call up at the Flexi Eventing Final the previous week slotted into third place on Miss Cole. Once again, huge entries in the Senior 90cms class meant it was subdivided into two. Suzanne Maguire had a fantastic win in the ‘A’ section on Monlough Meteor, followed closely by a delighted Enda McKenna from Castle Leslie with his faithful companion, Smokey Joe. Lucca Stubington was thrilled with her third placing on Xanthe Green, who has been performing so well in the Flexi Eventing. Georgina Brown took the red rosette in the ‘B’ section with Ballycreen Milady, her seven year old mare by Kings Master who was just fractionally off the optimum time. Conor Savage had a very good day at the office picking up second place on Blue and third place on Toby. Six riders finished faultlessly in the Junior 90cms class, with Sophie Morrow and her little Connemara-bred pony, Silver Boy, almost in perfect pace to take the top spot. Megan Carson and Dun A Deal were second just ahead of Ellen Ward and Phoenix Delight. Four of the seventeen starters in the Senior 80cms class had a perfect run with Angela Fynn having forgotten nothing of her equestrian skills to occupy the top spot on Knightsbridge Bob, just ahead of Claire Killen riding Dunluce Aoife and Glenda McNeice and Oscar. Ralph Robinson certainly got due recognition for all his hard work when he won the Junior 80cms class with Powder Day, a super little horse which he has just recently acquired. The partnership has been making consistent progress in the Flexi Eventing Series and it is very pleasing to see these efforts rewarded. Another fairly new partnership, Charlotte Cochrane and Tullymurry Abbie, took the runner up spot with Laura McKevitt and Kiss Me Quick picking up third place. Eventing Ireland is deeply indebted to David Corbett for the use of his excellent facilities at Tyrella which allowed the event to run in perfect conditions even with the recent heavy rain. There was a steady stream on Sunday for the ‘Go As you Please’ which provided an opportunity for folk to compete at leisure over the courses used on the Saturday. Altogether, there were incredible numbers taking advantage of a wonderful family outing on both days. Saturday 23rd March marks the start of the Northern Region One Day Events at Tyrella. Spectators are most welcome and if anyone would like to help in any capacity, please contact Dora on 07876758979. Class 1 - 1m at speed of 520 mpm: 1, Toni Quail, Ringfort Rua; 2, Holly Boal, Bonmahon Flash; 3, Denis Currie, Arodstown Aramis; 4, Adam Haugh, Ballybolger Lionman; 5, Camilla Manningham-Buller, Sunday Bolero; 6, Ben Rowlatt-McCormick, Barnaby. Class 2 – Im at speed of 475 mpm: 1= Alex Cleland, Rafa Smash & Emily Corbett, Layla; 3, Laoise O’Farrell, Miss Cole; 4= Hannah Morrow, My Good Thyne Girl & Hannah Thompson, Ballylurgan Diamond Prince; 6, Christina Turley, Rosie. Class 3A- Senior 90cms: 1, Suzanne Maguire, Monlough Meteor; 2, Enda McKenna, Smokey Joe; 3, Lucca Stubington, Xanthe Green; 4, Liz Wilson, Snowball; 5, Gemma Goodrich, Bubble; 6, Sarah Turley, Chestnut Hill Merlot. Class 3B- Senior 90cms: 1, Georgina Brown, Ballycreen Milady; 2, Conor Savage, Blue; 3, Conor Savage, Toby; 4, Charlotte Dixon, George; 5, Lucie Glynn, Turbo; 6, Maurice Bingham, Shannondale Gwen. Class 4 – Junior 90cms: 1, Sophie Morrow, Silver Boy; 2, Megan Carson, Dunadeal; 3, Ellen Ward, Phoenix Delight; 4= Sarah O’Shea, Oreo & Anna McCaldin, Said and Dun; 6, Julia Heron, Paris. Class 5 – Senior 80cms: 1, Angela Fynn, Knightsbridge Bob; 2, Claire Killen, Dunluce Aoife; 3, Glenda McNeice, Oscar; 4, Emma Leathem, Drumcill Hot Toddy; 5, Hannah Blakely, Goldengrove Silhouette; 6, Kerry Gilmore, Shannon. Class 6 – Junior 80cms: 1, Ralph Robinson, Powder Day; 2, Charlotte Cochrane, Tullymurry Abbie; 3, Laura McKevitt, Kiss Me Quick; 4, Amy McLaughlin, Knockgraffin Girl; 5, Rachael Broome, Boyher Cookies N Crème; 6, Melissa McKinstry, Simply Dun.